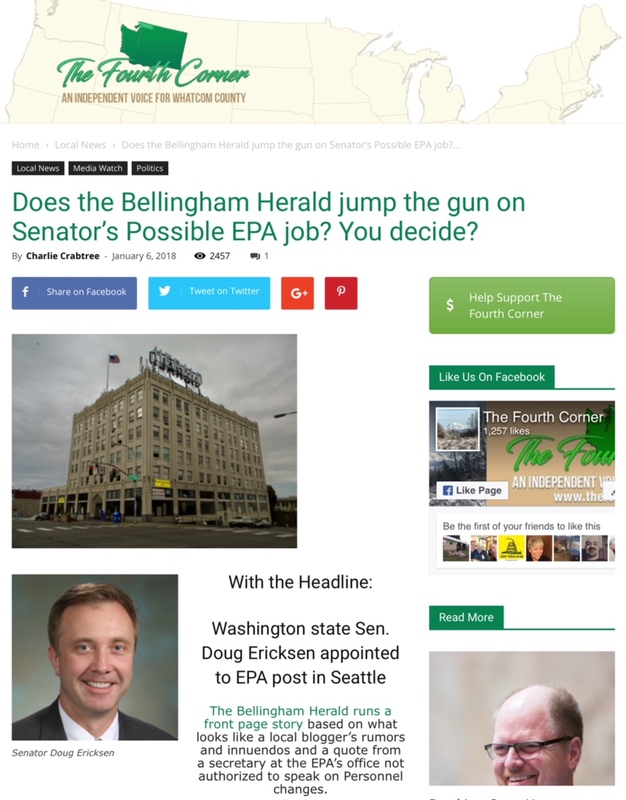 On January 6, 2018, Republican state Senator Douglas Ericksen found himself on the front page of The Bellingham Herald, and the subject of headlines in numerous other news publications later that day and over the weekend, for having been appointed to the position of senior adviser to the regional administrator in the Environmental Protection Agency’s Region 10 office, in Seattle, Washington. Ericksen tried to quash that news by saying the story was false, and by calling those press reports “erroneous.” Local reporter Kie Relyea, first broke the story on January 5, in the online version of The Bellingham Herald. Perhaps the senator from Ferndale, Washington, thought that his tactics on January 8, 2018, of denying the news reports, avoiding pointed questions, and offering vague statements, while also attacking the news media’s credibility, would result in there being no further discussion and questions about the recent EPA appointment which he was not willing to specifically admit he received, and which, to all appearances, he had accepted, and had planned to start that very same day. Ericksen’s seeming hope that he had soundly put that news story to bed on January 8, would soon be dashed when on February 27, 2018, FOIA public records containing hundreds of email communications between EPA employees, and a few with Senator Ericksen, relating to his appointment and plans to join the EPA, were released by the agency and brought to light in a February 27 article by Jim Brunner, a reporter for The Seattle Times. Brunner had requested the records in January. In reading The Seattle Times article, while it certainly provided some critical information and needed answers, I still had more questions that I wanted answered, so I combed through those email records responsive to Brunner’s request that were released and which are accessible on the FOIA website. After reviewing those email communications, I felt the need for daylighting more information on the curiouser and curiouser situation of the senator’s appointment, and of his seeming inability to tell the truth to his constituents, the public, and the news media about what really happened. Reviewing the online records helped to piece together most of what looks to have occurred in terms of Ericksen’s EPA appointment. After first providing in this article, a summary of events starting back with the senator’s first EPA appointment in January 2017, up through his most recent December appointment offer with the agency, I included an addendum with a very detailed chronology of email communication content that I compiled. Together, these offer a much fuller picture than what Senator Ericksen put forth to the press and the public in response to the news of his new EPA appointment. While still maintaining his job as a state senator, Ericksen had been employed in 2017 (for a period of 120 days) with the EPA, after having been appointed by the White House administration to a Temporary Transitional Schedule C position as Senior Adviser at EPA Headquarters in Washington, D.C. His appointment at that time, was made effective January 21, 2017, and ended on May, 20, 2017. During his 120-day term, Ericksen served as communications director for the agency’s transition team, a reward for his efforts as then-deputy director of Trump’s campaign in Washington state. His work on Trump’s campaign had earned him close to $39,000 in 2016, according to the Federal Election Commission records, as reported by The Seattle Times. In 2017, Ericksen had drawn a lot of criticism from his constituents for the 6-month period, during which, he juggled his EPA senior adviser position, and his state legislator job representing people in the 42nd Legislative District, in Whatcom County. Many Whatcom Countians felt greatly underrepresented by Ericksen, and they didn’t like that their senator was being paid $77.58 an hour (equivalent to his listed EPA annual salary of $161,900) by federal taxpayers for supposedly working full-time hours for those 6 months, while still also being paid his $46,839 legislative salary by Washington state taxpayers — they felt they were getting shortchanged on both ends, while footing the bill for his dual paychecks. Back on December 20, 2017, a reliable source with ties to the EPA informed me that Ericksen would be starting a new position, special adviser to the regional administrator for the Pacific Northwest and Alaska region (Region 10) office, in Seattle. Christopher Hladick was appointed Regional Administrator on October 19, 2017, and came on board to the EPA’s Region 10 office on December 4, 2017. He oversees environmental protection efforts in: Alaska, Idaho, Oregon, and Washington. The source who had first told me about the senator’s new EPA position, said Ericksen was supposed to start Monday, December 18, but that the date had changed and he would instead be starting after the new year. Upon hearing that tip, I called the Region 10 office that afternoon, on December 20, to try to confirm if the news I had heard was correct. I was unable to get any official confirmation from that phone call. However, I wrote a short piece about Ericksen’s rumored new EPA job which I posted on December 21, 2017, on my Facebook page, and that was later published on the Noisy Waters Northwest blog. Included in that piece, was information I had discovered that indicated Ericksen traveled to Washington, D.C., in mid-November 2017, according to expenditure reports filed with the Public Disclosure Commission. About two weeks later, on the morning of January 5, 2018, I called into the EPA Region 10 office to follow up, and I found out a bit more information about Ericksen’s new position. The staff person I spoke with told me his new position title was senior adviser to the regional administrator, and gave me the direct number (206-553-1906) for Ericksen . When I called the direct number that same day, the voice mail greeting said, “Douglas Ericksen is not available.” I posted a short piece on my personal Facebook page later that morning, on January 5, at 11:30 AM, about what I had learned after contacting the Region 10 office, and that piece was later posted on Noisy Waters Northwest’s blog. On January 6, local Republican operative Charlie Crabtree, who writes a local conservative blog called The Fourth Corner and who maintains its accompanying The Fourth Corner Facebook page, posted a blog piece which attempted to do some damage control for Senator Ericksen. In his blog piece, Crabtree tried to discredit The Bellingham Herald’s January 5 reporting on the story, and tried to discredit my reporting on the story in my Facebook post which I had posted in the morning on that same day, January 5. According to PDC online records, Crabtree is also a paid consultant for Ericksen’s senate campaign. Crabtree’s opening paragraph reads: “The Bellingham Herald runs a front page story based on what looks like a local blogger’s rumors and innuendos and a quote from a secretary at the EPA’s office not authorized to speak on Personnel changes.” Crabtree, in his write-up, also refers to “a radical far left environmental blogger,” which I have to assume is me, since I’m the only one who had written anything about Ericksen’s new position prior to The Bellingham Herald’s January 5 story. 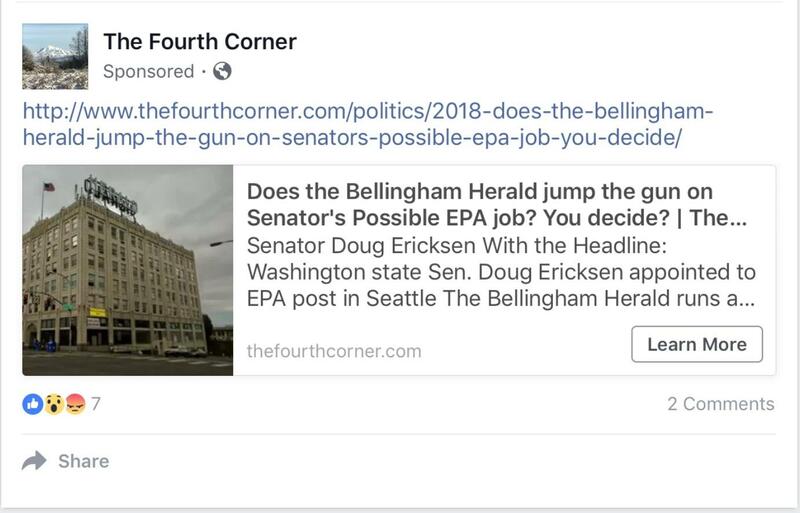 His January 6 Facebook post linking to his blog post was disseminated as a sponsored Facebook ad by his The Fourth Corner Facebook page, and the ad came onto my Facebook feed on January 6. Charlie Crabtree may need to update his workplace terminology to begin using the term “executive assistant,” which is the correct and more appropriately used term, rather than referring to the regional administrator’s executive assistant as “a secretary,” as he did in his blog post, while attempting, unjustly, to also place some of the blame on her for Ericksen’s mess that he made himself. 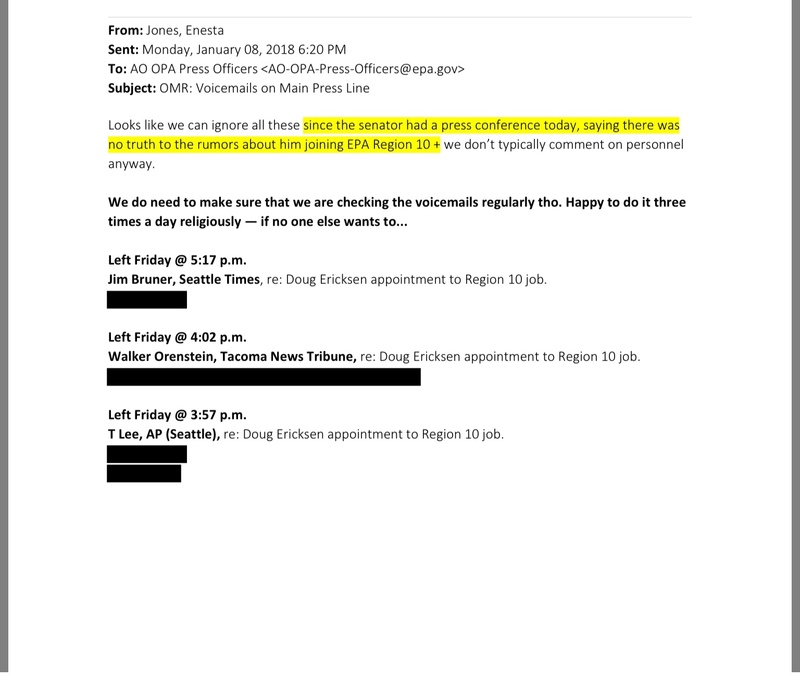 All the executive assistant did when asked by a reporter on January 5 whether Ericksen would be starting a new position with the EPA’s Region 10 office, was to state what she knew to be true at that time, which was that Douglas Ericksen had been appointed to a new job as the senior adviser to the Region 10 administrator for the EPA in Seattle, and that he would start his position some time in the near future. Her statement is backed up by evidence. Email records indicate that Ericksen had accepted the appointment and had been planning on joining the EPA on Monday, January 8, 2018. Ericksen changed his mind about joining the EPA as a senior adviser for the Region 10 office at some point — exactly when he did so is unclear — but according to email records, he officially informed the regional administrator, Christopher Hladick, while also copying two other individuals in a Friday, January 5, 2018 email the senator sent at 1:46 PM, letting them know he would not be joining the EPA, or as he phrased it, he would “not be able to accept this position.” Those two others were Jennifer Locetta, Special Assistant to the President and Associate Director of Presidential Personnel, and Charles Munoz, White House Liaison on the EPA team. Locetta was the Florida state director for Trump’s 2016 campaign. Munoz was the Nevada state director for Trump’s 2016 campaign. In 2010, when Munoz was a student at the University of Nevada Las Vegas, he was involved in the founding of the Nevada chapter of Americans for Prosperity, a conservative political advocacy group funded by Charles and David Koch. 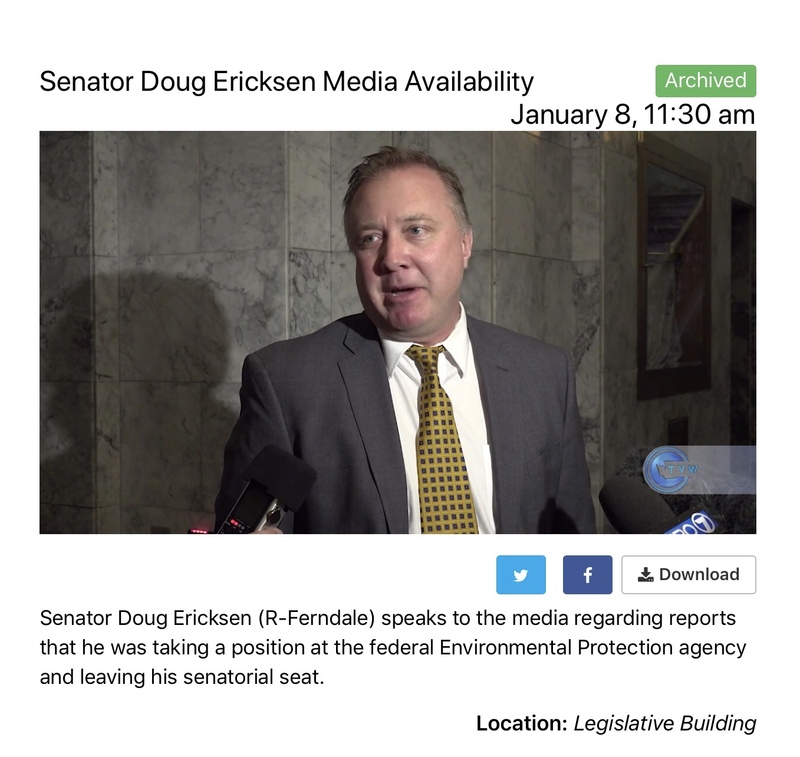 The following Monday, January 8, the first day of the state legislative session, Ericksen held a press conference at 11:30 AM, in Olympia, Washington, to deny reports that he had taken the EPA senior adviser position. He told reporters that while he had received and considered job offers from the Trump administration over the past year, he wanted to continue in the state Senate, representing constituents in his district. That statement is just one more example of the obscurities coming from the senator on the subject of his recent appointment to senior adviser to the regional administrator, which clearly had occurred, and that to all appearances, he had accepted, but then backed out of at the 11th hour. Minimizing the reality of the fact that he had been appointed and was scheduled to start a new position with the EPA, toward the end of the press conference, the senator told reporters, “So, I apologize for calling you all together for a much-ado-about-nothing story, but I just felt the need to correct it after what appeared in the newspaper last week.” As mentioned earlier, seven weeks later the EPA released hundreds of email records pertaining to that so-called much-ado-about-nothing. Those tactics of denial, and then calling press reports erroneous or incorrect, even when the reports were accurate, is a page out of Trump’s playbook on dealing with the press — call it fake news, and deny, deny, deny. It’s no surprise to see Ericksen, a loyal Trump devotee, employ those same tactics. Below, is an addendum which provides a detailed, blow-by-blow summary of EPA email communications. There is some commentary I’ve added that is included. According to email communications obtained through FOIA records, it appears that Senator Ericksen met with EPA and/or White House officials on or around November 14, 2017. 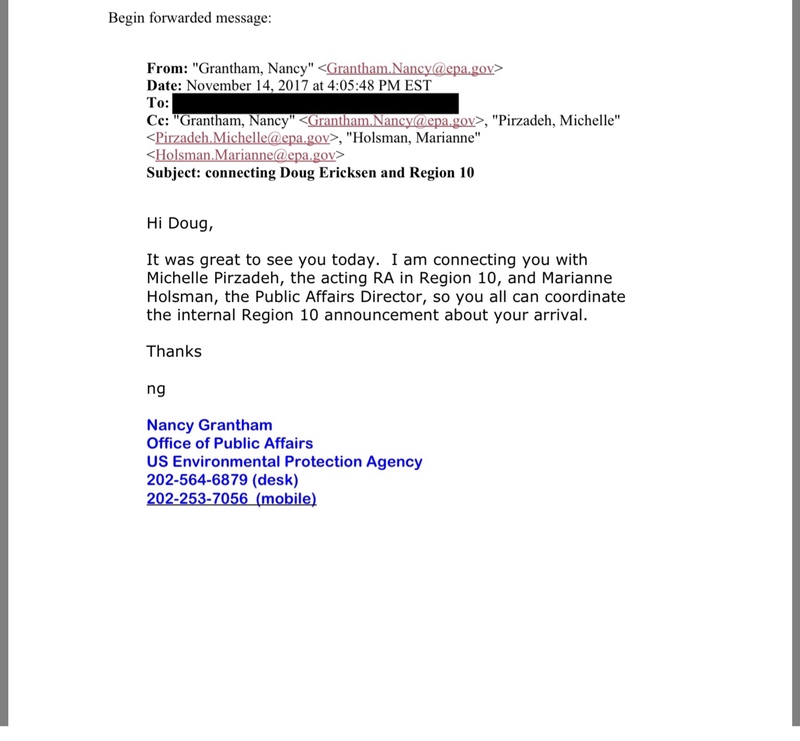 A November 14, 2017 email (sent at 4:05:48 PM EST) sent to Douglas Ericksen, from Nancy Grantham, Office of Public Affairs (OPA) at EPA Headquarters in D.C., shows that Ericksen had seen Grantham earlier that day at Headquarters (HQ), which indicates that there had been some kind of meeting between Ericksen and one or more EPA and/or White House officials regarding potential employment with the EPA. 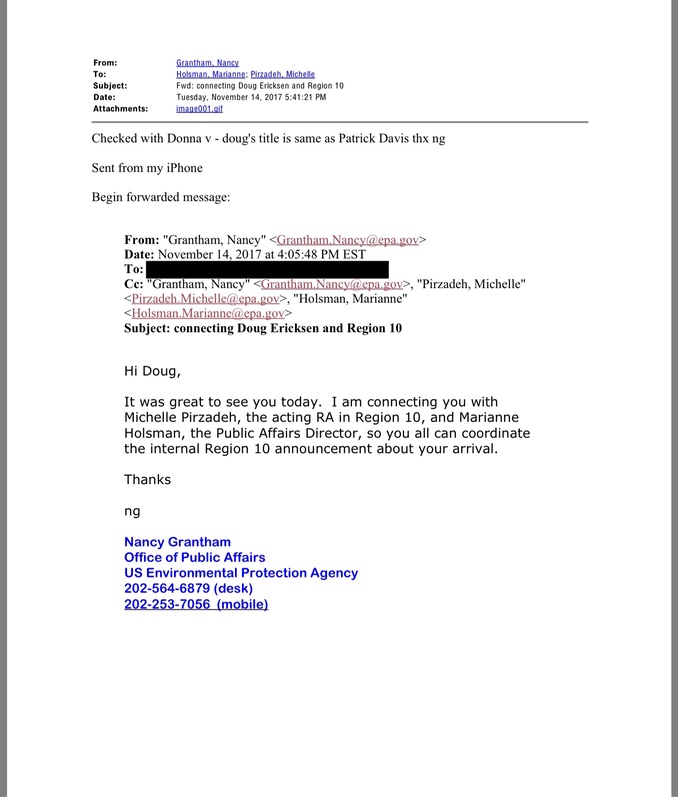 Grantham had Ccd EPA Region 10 Deputy Regional Administrator Michelle Pirzadeh, and Marianne Holsman, the Public Affairs Director for the EPA’s Region 10 office, on that email communication. 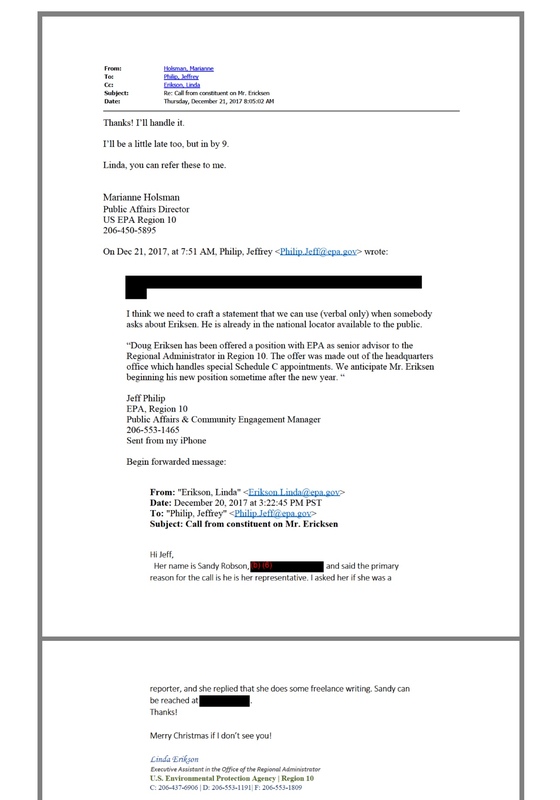 It appears that Ericksen was offered an appointment position with the EPA, at least verbally, either that day, November 14, 2017, or possibly prior to that, because Grantham said in her email that he should connect with Pirzadeh and Holsman about coordinating the internal EPA Region 10 announcement about Ericksen’s impending arrival to that office. Later that same afternoon, on November 14, 2017, Grantham, sent another email (at 5:41:21 PM EST) to Pirzadeh and Holsman, confirming that Ericksen’s new position title would be the same title as an individual she referenced, Patrick Davis. Davis is the senior adviser for public engagement to the Regional Administrator in the EPA’s Region 8 office in Denver, Colorado. Davis owns a Republican political consulting firm based in Colorado Springs, and was in the news recently for having received permission from the agency’s ethics review board to continue getting paid for work outside of his federal government job with the EPA. 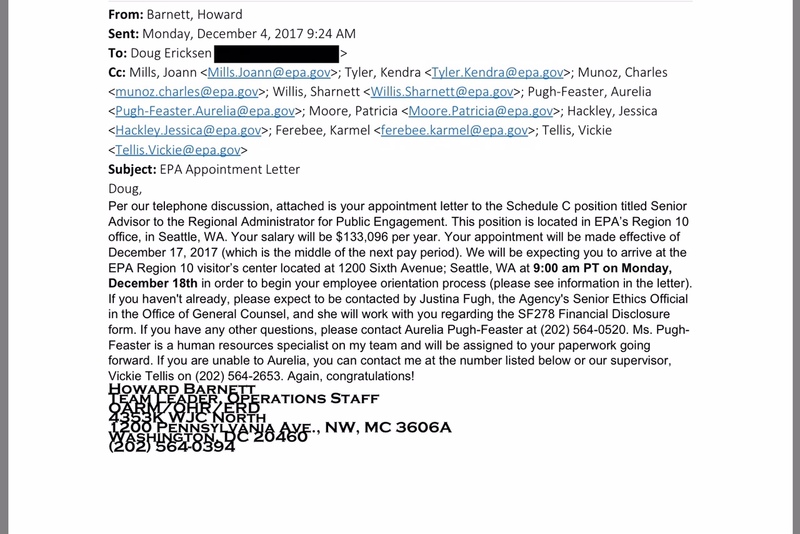 A November 27, 2017 email sent (at 11:04 AM) by Howard Barnett, Team Leader, Operations Staff, OARM/OHR/ERD (Office of Administration and Resources Management/Office of Human Resources/Executive Resources Division), to Joann Mills, the Management/Program Analyst at the EPA’s Region 10 office, and Ccd to Aurelia Pugh-Feaster, Human Resource Specialist OARM/OHR/ERD saying they are/were hoping that Ericksen would be cleared by OPM (Office of Personnel Management) in time to start his new position on December 4, 2017. The email explained he had been cleared by the security office, but that OPM had not yet released the required paperwork, and that Barnett hoped to know more by the next day or the day after that. 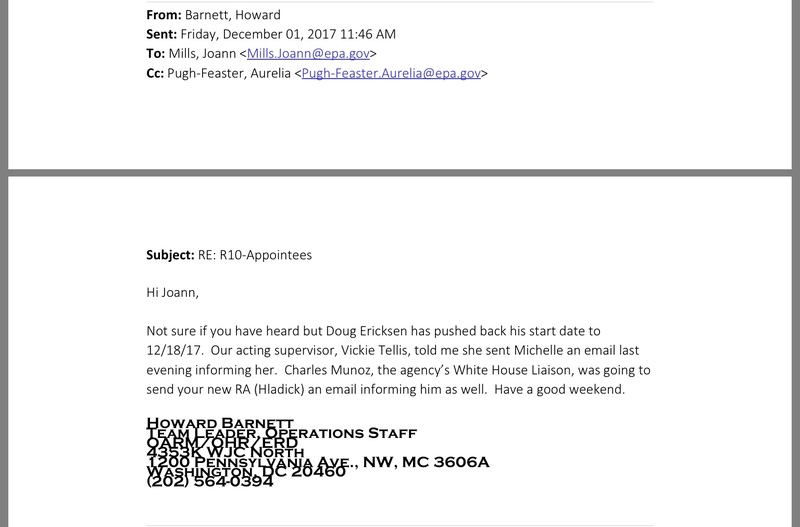 A November 29, 2017 email sent (at 2:23:47 PM EST) to Michelle Pirzadeh, from Vickie Tellis, then-Acting Director, Executive Resources Division, EPA HQ OARM/OHR/ERD, informing her that Ericksen “is slated to become the Senior Advisor to the RA [Regional Administrator] for Public Engagement under a Schedule C Appointment,” and that until Ericksen receives needed clearance by OPM, he could not yet begin his EPA employment. She said that they were anticipating making an official offer [written appointment letter] that week, and ERD was overnighting a package [needed paperwork] to Joann Mills in the Region 10 office. Howard Barnett sent a December 1, 2017, email (at 11:46 AM) to Joann Mills, and Ccd to Aurelia Pugh-Feaster, letting them know that Ericksen had “pushed back his start date to 12/18/17,” and that Vickie Tellis had informed her that she let Deputy Administrator Pirzadeh know about that change, via email, the night before. 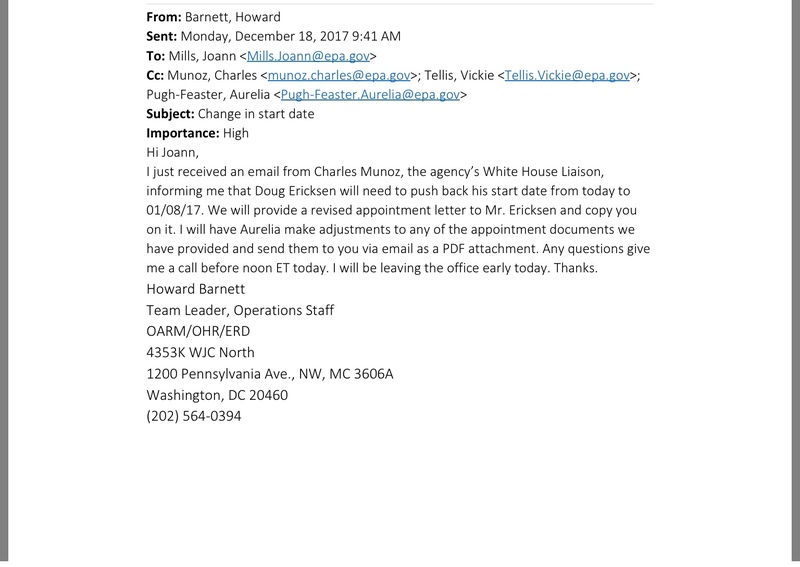 She added that the agency’s White House Liaison, Charles Munoz, was going to send an email to Hladick informing him of Ericksen’s start date change as well. 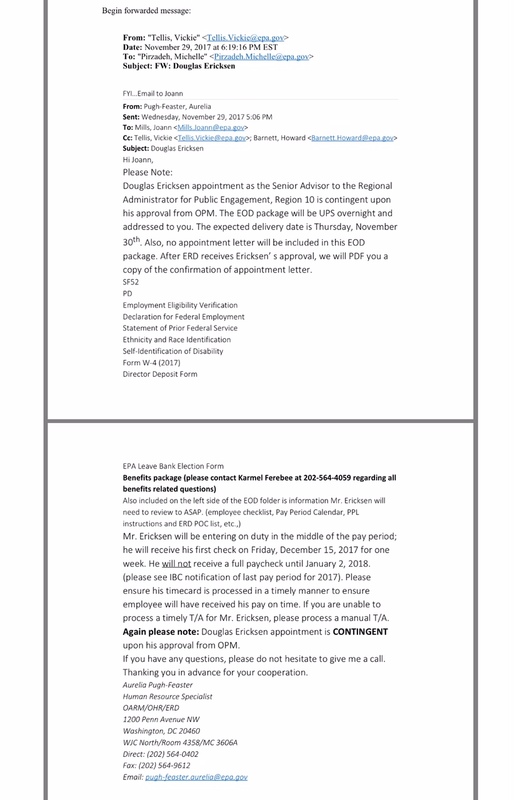 On December 4, 2017 (at 9:24 AM), Howard Barnett sent an email to Ericksen, and Ccd nine other individuals, with Ericksen’s attached appointment letter for his Schedule C position titled “Senior Adviser to Regional Administrator for Public Engagement,” to be located in the Region 10 office in Seattle. The December 4 email outlined that Ericksen’s salary would be $133,096 and his appointment would be made effective December 17, 2017, which would be in the middle of the next pay period. The email further informed Ericksen that he would be expected to arrive at 9:00 AM for his first day at the Region 10 office on December 18, 2017, to begin his orientation process, and informed him that he would be contacted by the agency’s Senior Ethics Official in the Office of General Counsel. Ericksen was contacted, via email, on December 6, 2017, sent at 11:17 AM, by Linda Tyson, executive assistant/scheduler for Regional Administrator Hladick. She was trying to schedule a lunch meeting at 11:30 AM for Ericksen with Hladick and Michelle Pirzadeh, in Seattle, on Friday, December 8th. At 11:43:48 AM, Ericksen sent a reply email, saying that 11:30 AM on December 8th works fine for him, and to advise him of the location. A follow up email indicated that Ericksen was to come to the Region 10 office that Friday for a quick meeting there, and then he, Hladick and Pirzadeh would head over to Tulio (restaurant) for lunch. According to email records, on December 14, 2017, Steven Breaz, of the Information Services Unit, sent an email (at 2:10 PM) to Michael Laurel and Anthony Williams also of the same unit, saying that a UMR request had come in for Doug Ericksen, and to have everything ready to go for him on Monday (December 18) morning. UMR stands for User Management Request. According to the EPA website, “UMR process is a procedure that the EPA Region 10 office uses to provide new employees, transfer employees, interns, contractors, and volunteers with a functional workstation. This process includes the provision of hardware, software, phone service, an email account, access to library and records management systems, system training, health and safety training, and other services required to conduct business.” I doubt that the EPA would be going through those kinds of preparation efforts unless those involved in the appointment or hiring process fully expected a new employee, such as Doug Ericksen, to start employment with the agency. 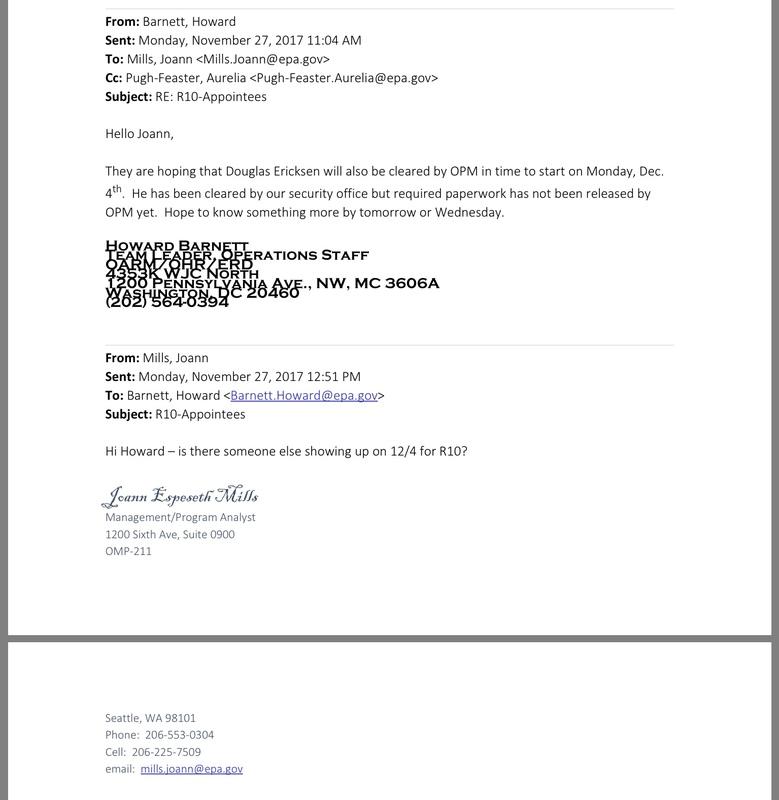 Email records show that on Sunday, December 17, 2017, there was a press inquiry from a reporter for KUOW Puget Sound Public Radio, John Ryan, sent via email (at 1:02 PM), to Public Affairs Specialists Mark Macintyre and Bill Dunbar, and to Public Affairs/Media Relations Specialist Suzanne Skadowski. Ryan said he heard that Senator Doug Ericksen would be starting a new job the next day, Monday, December 18, as senior adviser for public engagement at EPA Region 10, and asked them for confirmation of the details of the position. Macintyre forwarded Ryan’s email later that same day (at 4:29:21 PM), to Nancy Grantham (Public Affairs at HQ), and Ccd Region 10 Public Affairs Director Marianne Holsman. According to email records, a December 18, 2017 email was sent (at 9:41 AM) by Howard Barnett, to Joann Mills and Ccd to Charles Munoz, Vickie Tellis, and Aurelia Pugh-Feaster, informing them that the agency’s White House Liaison, Charles Munoz, had informed him that Ericksen “will need to push back his start date from today to 1/8/17 ,” and that they would be sending a revised appointment letter to Ericksen which they would also copy the email recipients on, and would make any needed adjustments to the appointment documents. FOIA records show that in late November through mid-December of 2017, there were various internal EPA emails between staff who had been getting things in place for Ericksen’s initial expected start date of December 4, 2017, and after that start date was changed, they were readying for his secondary expected start date of December 18, 2017. Back on December 20, 2017, I received a tip from a reliable source with ties to the EPA, that Doug Ericksen would be joining the EPA as special adviser to the agency’s Region 10 regional administrator. The source told me that Ericksen had been supposed to start that Monday (December 18), but that he would now be starting after the new year. Upon hearing that tip, I called the Region 10 office that afternoon to try to confirm if the news that Ericksen would soon be joining the Region 10 office was correct. The staff person in the regional administrator’s office I spoke to had no information on that, and the individual she additionally tried to check with at that time was in a meeting, so she took my name and number. Holsman, replied to Philip (at 8:05 AM) that same day, and Ccd Linda Erikson, saying she would handle it, and told Erikson that she could refer those inquiries to her. Included in the email records, was the December 21, 2017 press inquiry I sent, via email (at 4:00 PM), to Marianne Holsman, saying I was following up on my voice message I left her the day before, December 20, about having heard that Senator Doug Ericksen may be joining the EPA after the new year, as a special adviser to the agency’s Region 10 regional administrator. In my email, I asked for confirmation as to whether that news I heard was correct, and what his job title would be. Holsman sent me a December 21, 2017 reply email (at 4:34 PM), letting me know that the type of appointment/position I was asking about is handled by the EPA’s headquarters office in Washington, D.C. She also said that she copied Nancy Grantham in the HQ public affairs office on the email, who would get back to me. 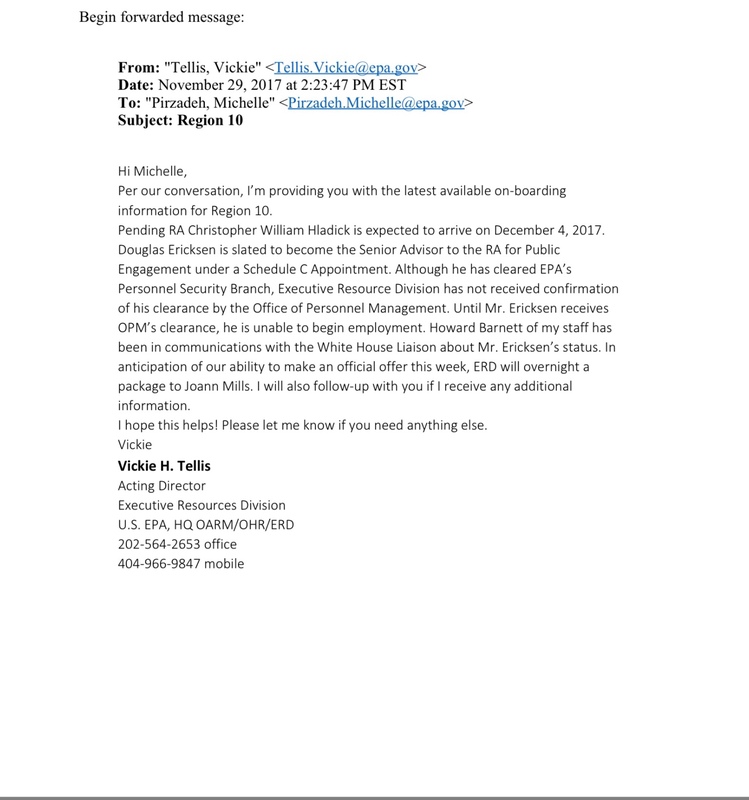 A week later, Deputy Regional Administrator Michelle Pirzadeh sent a December 28, 2017 email (at 11:45:00 AM) to Twanna Lesperance, Administrative/ Management Chief, OAES (Office of Administrative and Executive Services). Pirzadeh had some questions regarding eligibility for comp time for Ericksen’s appointment, saying that Ericksen had asked whether his position is eligible to earn comp time (regular and travel), and it was her understanding from Howard Barnett that the position can earn comp time, but there is an 80-hour per year limit, so she wanted to confirm with Lesperance if that was correct, and confirm if her understanding that Ericksen’s appointment is eligible for telework is correct. She asked Lesperance to call her. 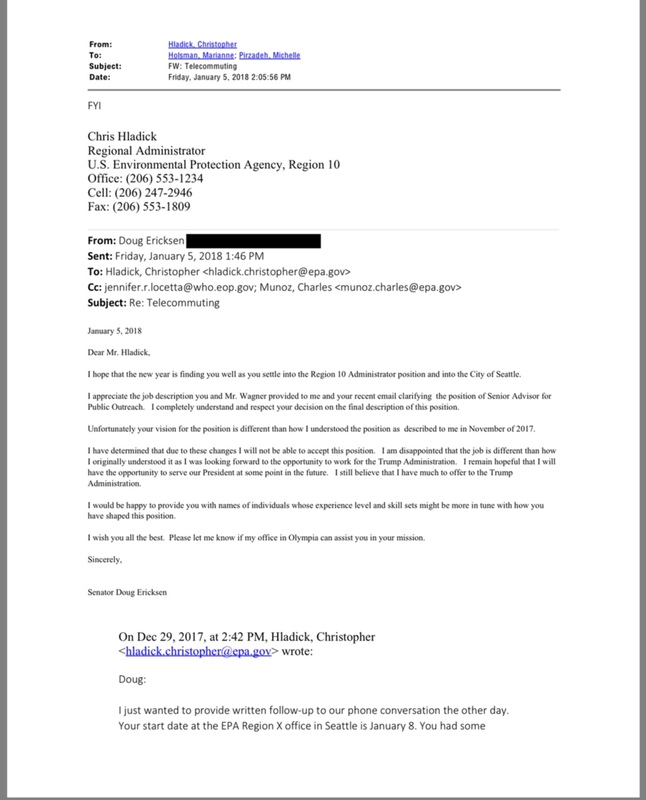 Regional Administrator Hladick sent Ericksen a December 29, 2017 email (at 2:42 PM), saying that he was following up their phone conversation from “the other day.” After stating that Ericksen’s start date was January 8th, he then addressed some questions that were apparently raised by Ericksen during that phone call, about the applicability of comp time and the availability of telework since he would have a long commute from Ferndale. From his reference to a phone call with Ericksen, it appears that Hladick and Ericksen talked on the phone a number of days prior to Hladick’s December 29 email. 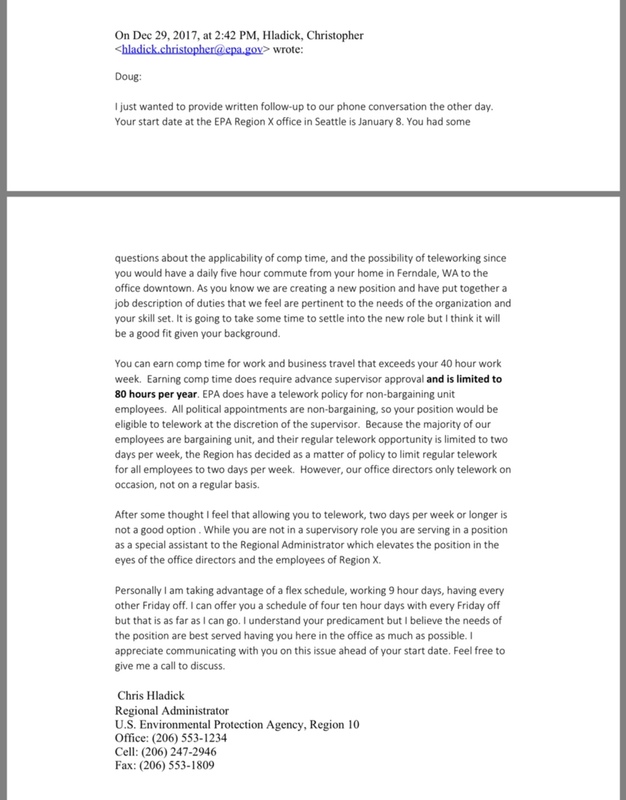 Hladick closed his email by saying that he felt allowing Ericksen to telework two days per week or longer would not be a good option. He offered the idea to Ericksen of potentially working a flex schedule of four ten-hour days with every Friday off, saying though, that would be as far as he’s able to go on that. Hladick said he understood Ericksen’s predicament, but he believes the needs of the position are best served having Ericksen in the Seattle office as much as possible. There were also records of several January 5, 2018, emails which were received by EPA Public Affairs after the article about Ericksen’s appointment was published that afternoon in the online version of The Bellingham Herald. Those emails contained numerous press inquiries from reporters with various publications. 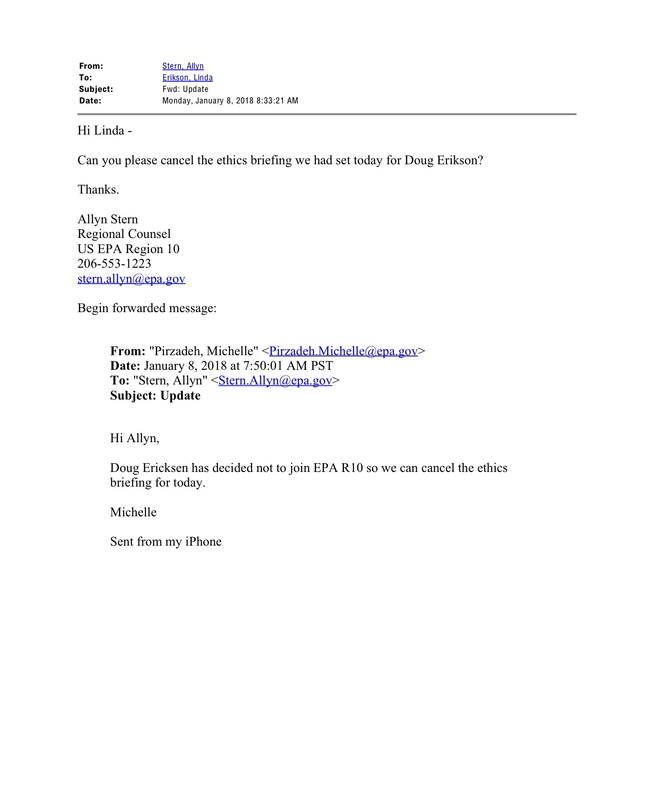 There was a January 8, 2018 email sent (at 7:50:01 AM PST) from Region 10 Deputy Administrator Pirzadeh, to EPA Regional Counsel (Region 10) Allyn Stern, canceling the ethics briefing that had been scheduled for that day for Ericksen since he would not be joining the EPA. In the email records released, there were some additional emails between internal EPA staff over the next several days after Ericksen’s January 8 press conference. Those emails mostly consisted of sweeping up the last remaining crumbs of what started as a Trump administration appointment to an EPA post, but ended in the senator from Ferndale all but disavowing that it had occurred, which seemed to clear the way for him to return to his senate seat in the Washington State Legislature. This entry was posted in Blog Post, Commentary, Information and tagged Charles Munoz, Charlie Crabtree, Christopher Hladick, D.C., Donald Trump, Doug Ericksen, Environmental Protection Agency, EPA, EPA Region 10 Office, Ferndale, Howard Barnett, Jennifer Locetta, Marianne Holsman, Michelle Pirzadeh, Nancy Grantham, The Bellingham Herald, The Fourth Corner, The Seattle Times, Vickie Tellis, Washington, Washington State Legislature, Washington State Senate, Whatcom County, White House. Bookmark the permalink.